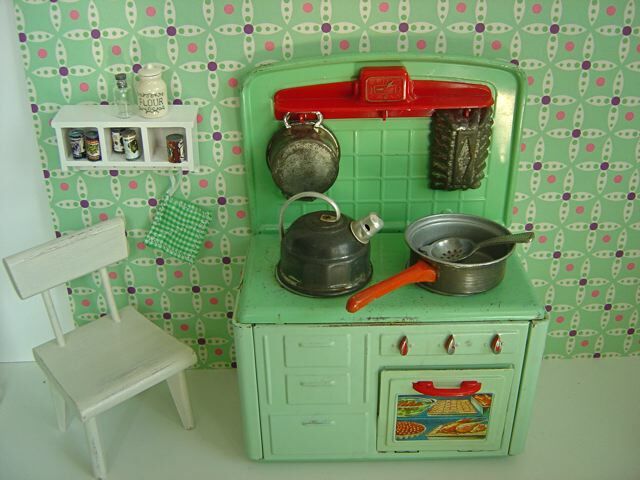 Sink, Refrigerator and Stove: An amazingly-complete, tinplate kitchen set in near-perfect condition, with plastic used solely for knobs, handles, backsplash and taps. Made by the West German company, MFZ, during the post-war period, with opening doors on all pieces - please see the detail shots, especially of the wonderful little frig. This set has delightful period details too, from the rounded edges to the illustrated meal, apparently cooking "inside" the oven. The stove features a hanging rack to hold an extra metal pan and cake mould - to complement the large pan, strainer and large kettle on the stove top. (The kettle even has the removable whistling device!). 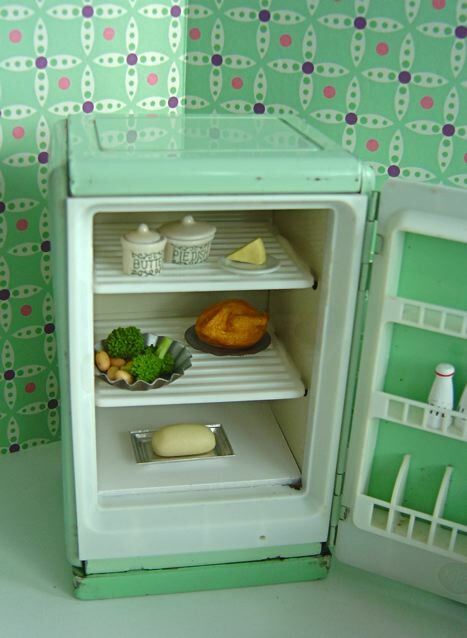 The frig contains a chromed milk rack and three bottles of milk, a roast chicken, a dish holding broccoli and potatoes, cheese and bread on plates, plus two ceramic pots for butter, etc. Note: there is a scattering of rust on the left exterior side of the frig - if you'd like to see a photo of this before buying the room set, please contact us. 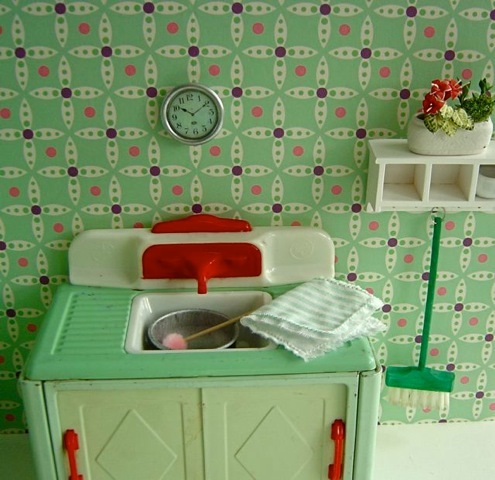 The sink holds another large mixing bowl, a washing-up wand and a drying-up cloth. Table: A craftsman-made, wooden table with the same rounded corners as the appliances, set for a healthy breakfast of fruit and bread and cheese. 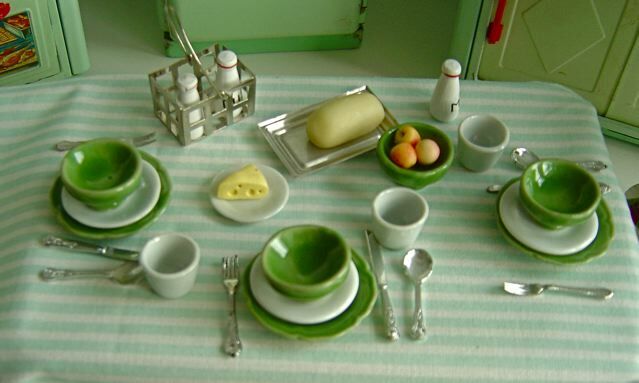 There are three, complete, ceramic place settings - comprising green dinner plates, white side plates, green bowls, white drinking cups and silvery plastic cutlery, all resting on a striped cotton tablecloth. Chairs: Stylish, mid-century modern chairs, with the essential tapered legs, made by the high-quality American manufacturer, Strombecker., and painted white. Shelves: Two modern shelves hold five tins of food, an apothecary jar and some more ceramics. The hooks beneath hold the hot-pad and the green broom. Walls: Covered in handmade, retro-styled wrapping papers, which have been mounted on two pieces of 5mm thick, A3 foam board. Each piece of foam board measures 42 x 29.5cm or 11 5/8 x 16 3/8 in. 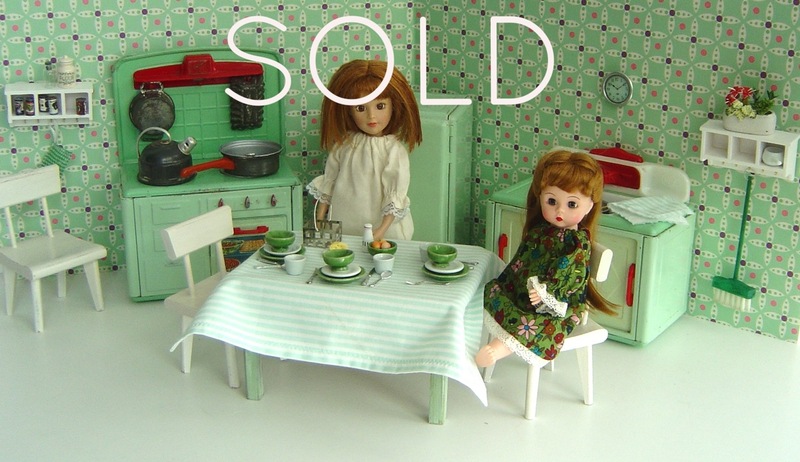 Dolls: Available from our selection of vintage dolls, described in detail in the DOLLS section of our website. Shown here are an unusual, modern teenage Madame Alexander doll with auburn hair and her younger sister, also a Madame Alexander doll with incredibly long auburn hair. If you’d like to buy either of these dolls, dressed in these clothes, please contact us for a price. Note: Many other items of lovely clothing are also available for each of these dolls.